paperuk.com has four stock forms with label(s) that you can buy online. 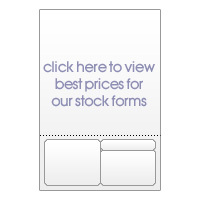 Click here to view our stock forms. All stock forms have integrated labels with a strong permanent adhesive and are 100% laser guaranteed. Each box is shrinkwrapped to prevent the documents from getting damp in transit and taking in moisture. Each box contains 1000 forms along with an 'forms handling instructions sheet'. Who uses documents with integrated labels? No more printing separate label operations as the label is printed at the same time as document. Eliminates the possibility of mismatches between label and goods. Promotes your business in a positive way. Label Peeling Tip - Always try to peel the label from the edge and not the corner.